The California Exposition & State Fair (CE&SF) is an independent state agency established by law and governed primarily by the California Department of Food and Agriculture codes. Governed by an appointed Board of Directors, daily operations are managed by a permanent staff of 100. During the State Fair more than 2,000 temporary employees are hired for the event's duration. The CE&SF is a self-sufficient operation that receives no government funding but still has an estimated economic impact of more than $250 million on the region. The California legislature created the State Agricultural Society to promote California's reputation for farming and industry. An agricultural exposition was organized and held in San Francisco in 1854, and California Historic Landmark #861 marks the site. Given that travel was difficult in that era, the next several annual expositions were moved around the state, to Sacramento, San Jose, Stockton, and Marysville. In 1859 the exposition returned to Sacramento, and it was decided that a permanent site should be found. Capitol Park, a six block site bounded by E, H, 20th and 22nd Streets was purchased and was home to the state fair for the next fifty years. Growth in population and attendance forced the purchase of 80 acres (320,000 m2) just outside the city limits on Stockton Boulevard and the first fair was held there in 1909. Continued growth caused that site to be expanded by 75 acres (300,000 m2) in 1937. During and after World War II, from 1942 to 1947, the Fair was suspended and the fairgrounds were occupied by the Army. During its formative years (1929-1942), the California Highway Patrol used some of the State Fair facilities as an unofficial "training academy", later using other state-owned areas in the Sacramento area for training use until the current CHP Academy was opened in 1976. In 1948 the state purchased a large tract of undeveloped land along the American River north of downtown Sacramento. Funds were not allocated to begin construction on this land until 1963, and the Fair continued at the Stockton Boulevard grounds until 1967. In 1968 Governor Ronald Reagan opened the Fair at the "Cal Expo" site, which covers over 350 acres (1.4 km2). In addition to the annual fairs, Cal Expo hosts a number of other events such as the annual Dixieland Jazz Festival, car and RV shows, Christmas Tree Land, and doll shows. 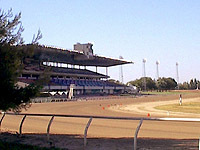 Also, the adjacent racetrack hosts harness racing meets almost year-round (with the exception, of course, of the State Fair dates that schedule thoroughbred racing), as well as motorcycle racing and concerts. Cal Expo officials announced in Summer 2009 that for the 2010 State Fair, the dates will be moved up to July/August 2010 instead of the usual August/September 2010 original planning. This is due to the fact that many local school districts are moving their first day of school dates to the last weeks of August, which is exactly when the state fair is open, and a majority of visitors to the fair are children, teenagers, and young adults, who, if the state fair was to keep original dates, would more than likely only be able to attend the fair on Fridays or the weekends. Rides and Games are operated by Butler Amusements. Butler Amusements' first year at the state fair was in 2009, while all other years before the rides and games operator were RCS Amusements. There is a permanent monorail system at the fairgrounds. The storage facility for the monorail trams are located in the northwest corner of the grounds. There are four different trams (Blue, Green, Orange, Red). They are only used during the state fair. The Maloof Brothers, owners of the Sacramento Kings, are looking to possibly build a new arena for the basketball team on Cal Expo grounds, replacing currently Kings home, ARCO Arena a few miles away. Talk are going through and seem to be going well. The Maloof Brothers and Cal Expo officials assure that no public money will be used in the building of the arena if the project goes through.